Most of the users of windows 10 operating system have reported that mouse cursor is not present and have disappeared on windows 10 PC. This is quite annoying problem and for a Operating system which went popular just because of Graphic user interface, lack of the most important part of GUI that is mouse makes it pretty difficult to use PC. But do not worry as we have found the solution to this typical problem and that too working one using which and following the steps you can easily fix your mouse disappearance problem on your PC. Note: If you are using a laptop, just try pressing fn key and any of the key from F1 to F12. You have to try with each key from F1 to F12 with fn and try to find out your mouse cursor has got enabled or not. Since most of the laptop manufacturers have provided this functionality to turn off the Mousepad and mouse usinf fn key and any of the key F1 to F12. Try Pressing F1, F2, F3 and so on individually and keep checking your problem get fixed or not. Try pressing fn and F1 together , then fn and F2 together and so on and check that your problem has been solved or not. This may re enable your mouse pad again if it has been turned off accidentally by you in any case. If it does not get solved , try methods given below. 1 – Press windows key + I together to open settings panel. 2 – Now, Press Tab to select first item and then use arrow key to navigate and finally once devices is selected, hit enter. 3 – Now, use again Tab and Arrow keys to select Mouse from left side menu. 4 – Now, choose additional mouse options. 5 – Now, choose Clickpad from the top tabs. 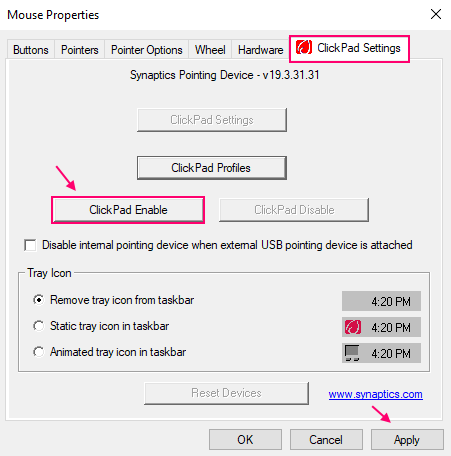 6 – Finally choose ClickPad Enable to enable mousepad. Most probably your mouse pointer will get restored. 1 – Press windows key and R together to open run. 2 – Now, write devmgmt.msc in it and press enter key. 3 – Once the device manager window opens up., follow steps below. 4 -Press Tab key to select topmost main entry from the device manager list. 5 – Now, keep pressing down arrow key to move downwards and reach to the point of Mice and other pointing device. 6 – Now, click right arrow key on the keyboard to expand it. 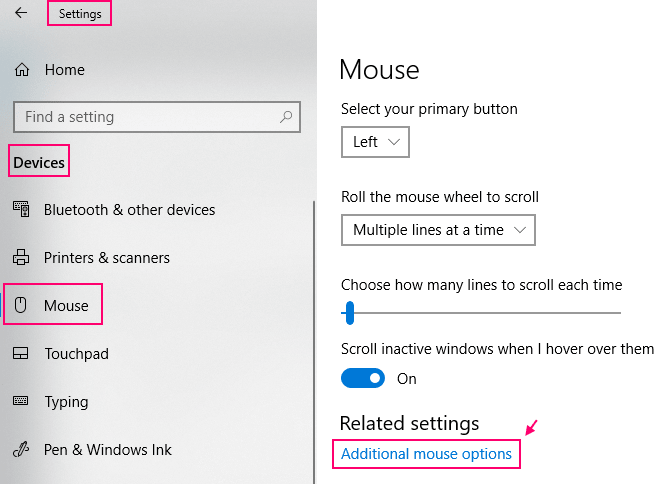 7 – Again press the down arrow key to select your mouse device. 8 – Now, Press Shift + F10 to open the context menu. 9 – Again select Update driver using down arrow key and then hit enter. 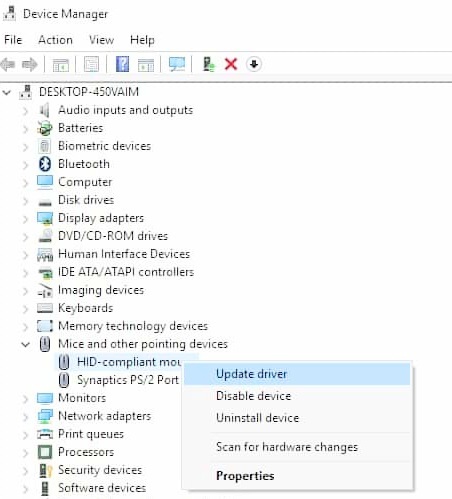 10 – Follow the on screen instructions to update the mouse driver.